Allergy - hypersensitivity of the immune system with repeated allergen exposure to a previously sensitized with this allergen body. Symptoms: pain in the eyes, swelling, runny nose, hives, sneezing, coughing and so forth. Scientists still do not come to a common denominator and can not say exactly where does the allergy, but the number of people suffering from some form of it, is growing. Among allergens are latex, gold, Pollen (especially ragweed, pigweed and common cockle), penicillin, insect venom, peanuts, papaya, jellyfish stings, perfume, eggs, mites feces, pecans, salmon, beef and nickel. One has only to these substances to start a chain reaction as your body sends its reply to a fairly wide range of reactions - from annoying rashes to death. Rash, swollen lips may start shivering, it lays nose and burns to the eyes. Food allergies can cause vomiting or diarrhea. A very unlucky minority allergy can result in a potentially fatal reaction known as anaphylactic shock. by felt-tip pen or a pen (ink or dye should be carefully selected, because they can cause allergic reactions). Allergens are administered via intradermally injection or small scratches inflicted on the patient's skin with a sharp object. If the patient is sensitive with respect to the test allergen, the inflammatory reaction develops over 30 minutes. This response can vary from mild redness at the site of the allergen until severe urticaria in susceptible patients. Due to the simplicity and efficiency of the method, skin tests - the most appropriate methods of diagnosis of hypersensitivity. However, they are not without adverse effects. Quite rarely, some patients may experience a state of delayed type hypersensitivity (DTH), develops 6 hours after administration of an allergen and which can last up to 24 hours. This phenomenon may cause long-term damage to the skin tissue at the site of the allergen. In addition, the introduction of new allergen can cause the body's sensitivity with respect to this new allergen and development of allergy in susceptible patients. 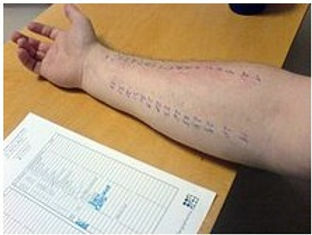 Sometimes it is not possible to allocate a specific allergen because of the lack of a skin reaction at the skin test, which, however, does not mean the absence of hypersensitivity in the patient. Treatment is carried out under the leadership of Eugene Lee to develop drugs from various allergies. Drugs not give side effects, which makes it possible to accept treatment and children. We guarantee a successful outcome.